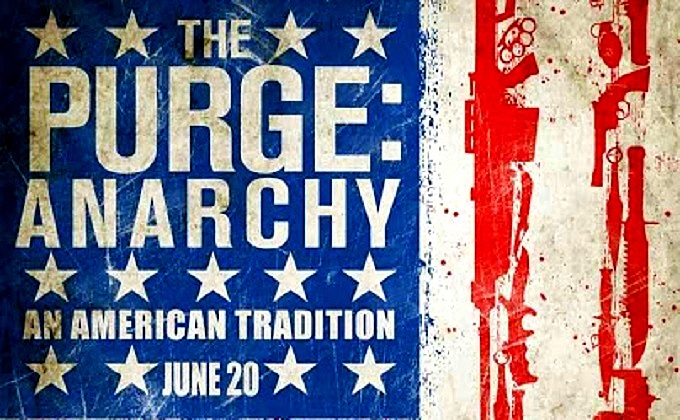 Come June 20th, audiences will attempt to survive the night again with The Purge: Anarchy, a sequel to The Purge. This short 1:35 trailer takes us right back into the event of The Purge, a 12 hour time frame in which all crime and lawlessness is legal. Unlikely as it sounds, in the future crime and unemployment are at an all-time low due to The Purge. Participants are able to release 364 days of pent up and suppressed anger and malaise in a short time frame, with no repercussions. I saw the first film in theaters, and I shared the same thoughts with most that the film suffered from severely flawed execution (Grade: D+). While its premise was intriguing, it had too many holes to look past. Suspension of disbelief, which is needed with any film if you think about it, had to be utilized heavily with this one. Despite the hole riddled premise, the biggest issues were its recycled home invasion plot and the (mis)marketing. You’ve seen generic home-invasion movies done better before, and the movie, while having 2-3 jump scares, is clearly not a horror but rather a thriller with some political tinges. The good thing about this trailer is that it shows the likely main characters taking on the doomsday scenario in the streets due to their car stopping moments before the purge is commenced. This immediately has more potential for unpredictability than the previous installment, and it will be nice to see this event outside of walls. The trailer shows gangsters and what would appear to be religious zealots patrolling and looking for victims. The small bit of acting does look suspect from the two leads, which was a problem aside from Hawke, Headey, and Rhys Wakefield in the last movie, but hopefully the acting is better than the kids and teens. I am not ready to say I am anticipating this film, but I will most likely find myself watching it…at matinee price. It is what it is with the premise, but the new setting has infinitely more potential, and hopefully that results in more tension. Color me intrigued. Honestly, I find the premise fascinating and genius to an extent. Hard to buy? Sure. But in the horror genre, realism is not very dominant. I agree though, the first one was executed awfully. This concept has potential. It just needs a good screenwriter…. Good point about the horror genre. The first didn’t feel like a horror to me though, but the premise around it certaintly qualifies it. Maybe this one will feature tighter writing; I definitely think the environment lends itself to the prospect.